Turkish delights. Photo by Javi Lorbada / . If your idea of paradise is finding an out-of-the-way bakery serving outrageous pastries or eating a homemade lunch you can't pronounce in a no-frills canteen, take time to peruse the archives of , a terrific website offering recommendations for real-deal delicacies in far-off places. Co-founder Yigal Schleifer shares a handful of gastronomic gems found around his old stomping grounds of Istanbul. ISTANBUL, Turkey – Istanbul sinks its magical claws into you and won't let go in a way that few other cities do. I lived there for eight years between 2002 and 2010, but there really isn't such a thing as leaving Istanbul. The city keeps calling me back, especially its old-school food spots and the people running them. The city's history and humble nobility sustain Istanbul through its sizable ups and downs. When I touch down in Istanbul, these are the places I make a beeline for. Chill while eating at the outdoors at Boris'in Yeri. All photos courtesy of Culinary Backstreets. 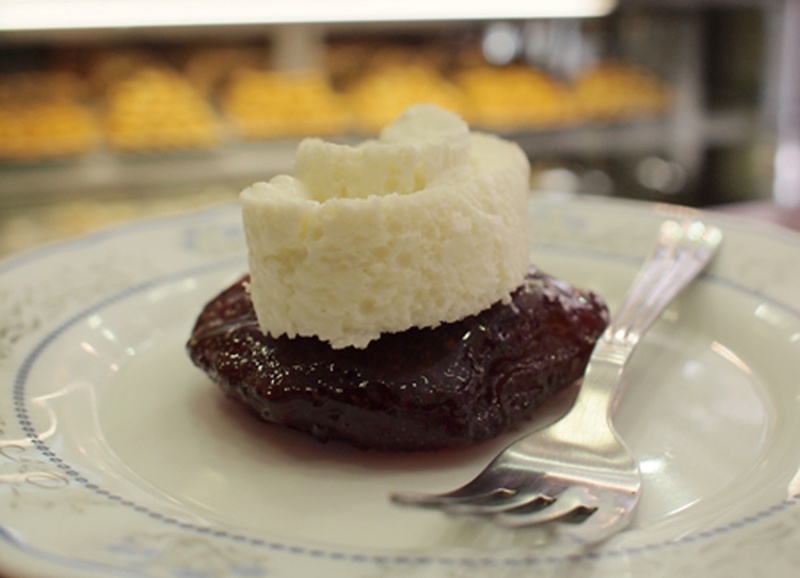 Kaymak, clotted cream made from buffalo milk, is probably the most blissfully delicious Turkish creation, the kind of thing that will eternally haunt your food memory dreams. It does mine. This spot is one of the last traditional kaymak purveyors in Istanbul, serving it with a drizzle of honey and a side of crusty fresh bread. Stepping through the doors here feels like stepping back in time. One of their famous egg dishes at Lades 2. 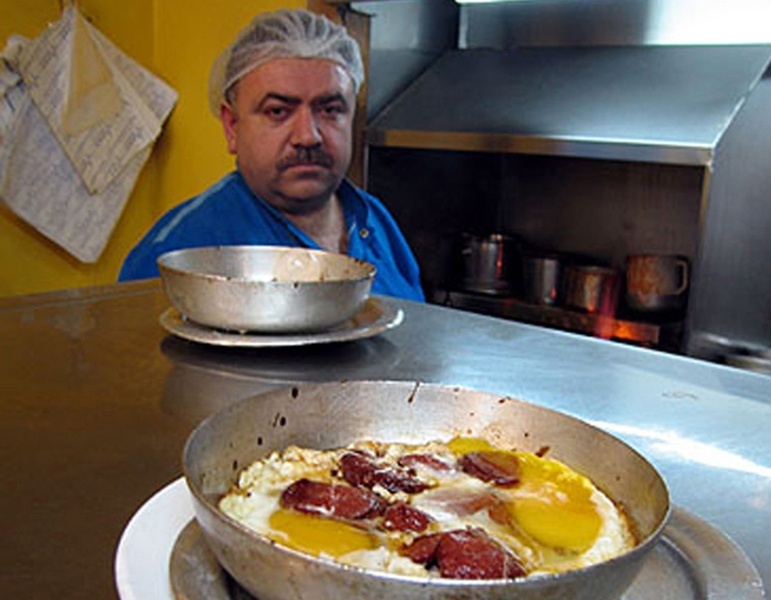 A Turkish version of a greasy-spoon diner, this cozy place specializes in all things fowl, from chicken soup to a variety of egg dishes and even a dessert that weds a thick, milky pudding with almost microscopic strands of poached and shredded breast, served with a sprinkle of cinnamon on top. The eggs — scrambled with tomatoes and peppers (AKA menemen) or fried with your choice of different cured meats, are uniformly outstanding. 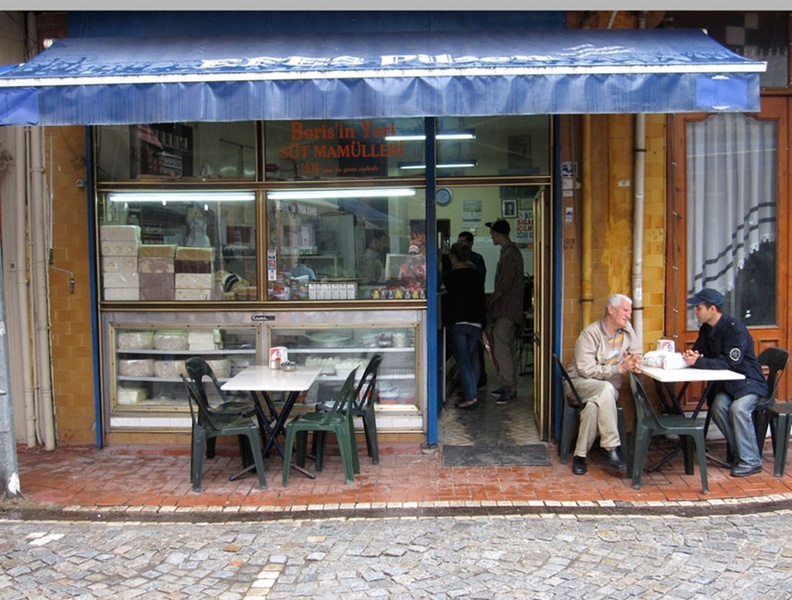 But it's their soul comforting tavuk göğsü, the chicken pudding, that remains a revelation every time I taste it. Quince as you never expected before at Sakarya Tatlicisi. Somewhere on the map of the world lies an invisible line that demarcates the region where quince is not a misunderstood "specialty" fruit but an integral and celebrated ingredient, used in both savory and sweet cooking. Turkey lies at the heart of this "quince zone" and my favorite take on the beguiling fruit is ayva tatlısı — large quinces that are halved and then slowly baked until they turn meltingly soft and are coated in a thick and sticky reddish glaze (the color coming from the pectin in the fruit's seeds). This tiny pastry shop in the Beyoğlu fish market makes a superlative and highly addictive version, serving it with a dollop of — what else! — kaymak. 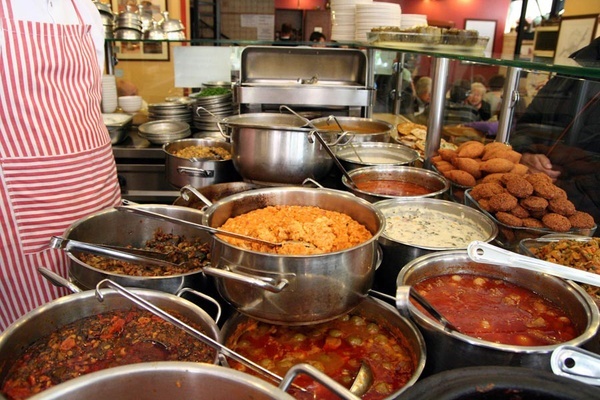 Pick from a wide variety of dishes at Çiya Sofrası. It may no longer be a hidden treasure — the founder has been profiled in the New Yorker and René Redzepi, and other celebrity chefs have sung its praises — but no matter, there are few other restaurants like Çiya in this world. Owner/chef Musa Dağdeviren's vision — to document and serve traditional Turkish regional recipes before they disappear — is both compelling and lovingly executed. Come here in spring, when the cooks do wicked things with bracingly tart early fruits, adding them to savory stews or grilling them with kebabs. One of the uttermost classics is Şahin Lokantası. 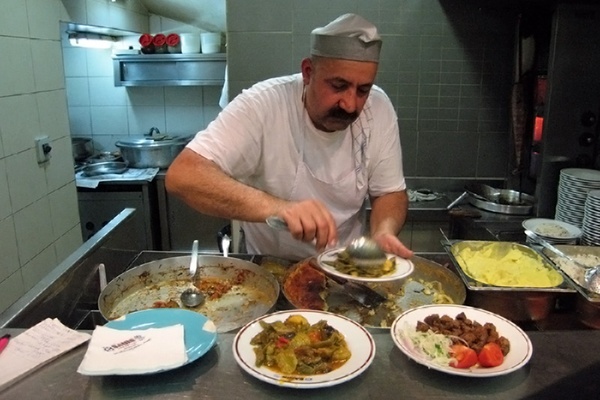 The esnaf lokantası, a no-frills canteen, is Turkey's most ubiquitous type of restaurant. Although roughly translated as a "tradesmen's restaurant," it is really an extension of the home kitchen, a place where the spirit of every diner's mother seems to be stirring the pots. Open since 1967, this spot is where I learned to not only love but actually crave liver, more specifically their weekly special of "Albanian" liver, small cubes of tender meat that have been dusted with flour and red pepper flakes and then fried. I've more than once timed an Istanbul visit to coincide with Şahin's "Liver Tuesdays." Urfali Haci Usta is the kebab place you've always wanted. Istanbul's scrappy Aksaray neighborhood has long been home to transplants from all over, these days Syrians especially. 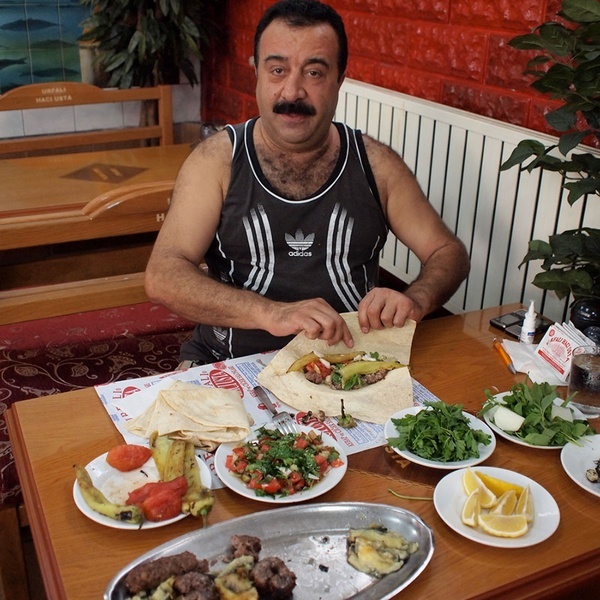 But there's one street in the area dominated by grill houses serving the food of the southeastern Turkish city of Urfa, known for its kebabs and isot, a dried red pepper that hits strikingly deep and rich notes, the Barry White of the spice rack. My favorite spot here, Urfali Haci Usta, recreates the exuberant hospitality found in Urfa and serves up a superb patlican kebab, chunky discs of fatty minced meat that are interlaced on a skewer with big hunks of eggplant and then all grilled together. What's better than fresh foraged mushrooms, rustic bread and, butter? 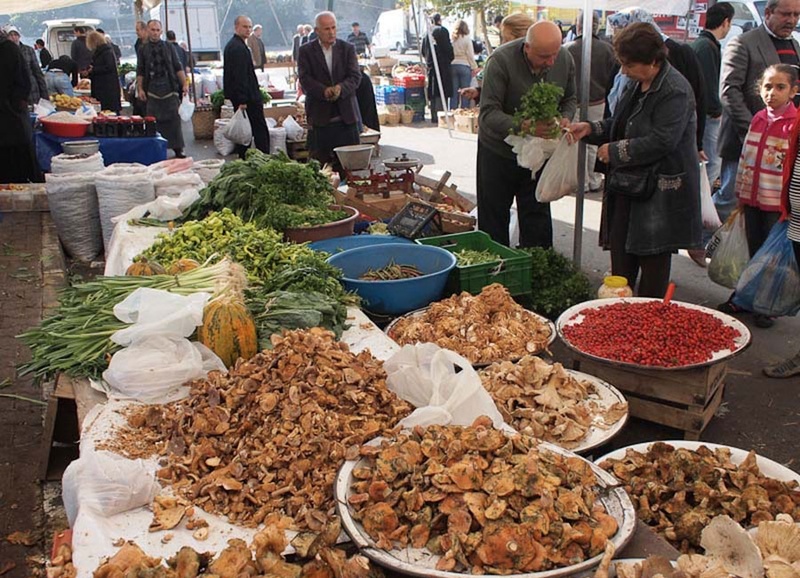 Just off of Bahriye Caddesi, near Sururi Park, this outdoor bazaar pops up every Sunday like a village market from another planet landing in the heart of Istanbul, in this case the other planet being Turkey's Black Sea coast. 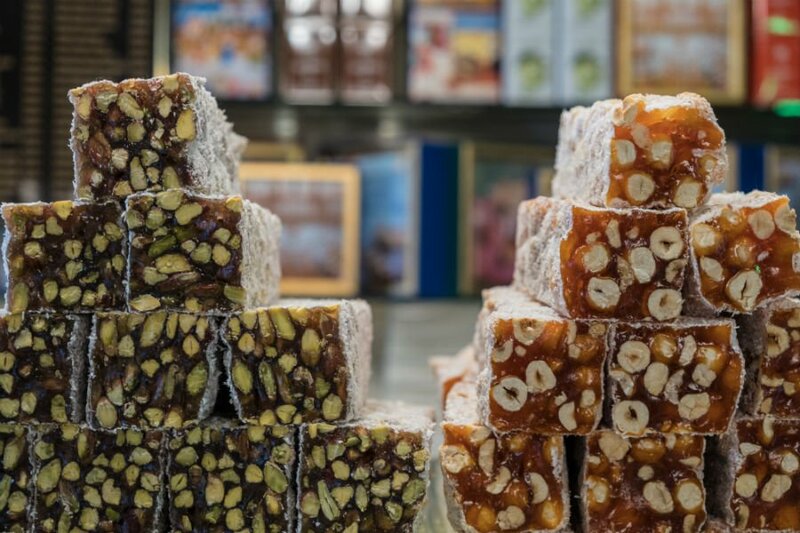 A land of big mountains, green pasturelands, and lush forests, the Black Sea is Turkey's culinary oddity, the menu here dominated by little anchovies known as hamsi, cornmeal, hazelnuts and dairy. Don't come to this market looking for kebab but do come here if you're in need of freshly foraged mushrooms, large loaves of rustic bread, big mounds of butter, mountain honey or jams made from fruits you've probably never seen before. Yigal Schleifer is co-founder and editor of , which covers the local food scene and leads small group culinary walks in a dozen cities around the world. Based in Washington, DC, Yigal previously lived in Istanbul for eight years and returns there regularly. You can find him on @culinarybackstreets. Yigal travels for kaymak.